I bet you never expected to see this! Despite ceasing to play DBMM in April, I still subscribe to a few lists just like I do to a few DBM lists. It's a vicarious pleasure not unlike car crash TV: you know you shouldn't look but do anyway. Recently two things caused me to revisit some work on spontaneous advance I'd done in February but never published. The first was the usual DBMMlist flurry of "tis, tisn't" emails on how difficult it is to interpret the spontaneous advance rules in DBMM v2.0. The second was a post on the DBMM Forum by David Cantó from Barcelona who posted a flow chart for the spontaneous advance rules. If like me, you find the text unclear, this should help you unravel the options for impetuous troops. The one thing it doesn't cover is halting when in an overlap position: impetuous troops have a choice of what to do. The diagrams weren't finalised because, at the time, I struggled to get anyone to help me "sign off" the diagrams as "correct under DBMM v2.0". Yet today it was easy to check them using the flow chart and confirm them with the help of some comments from members of the DBMM Forum (thanks Lawrence). 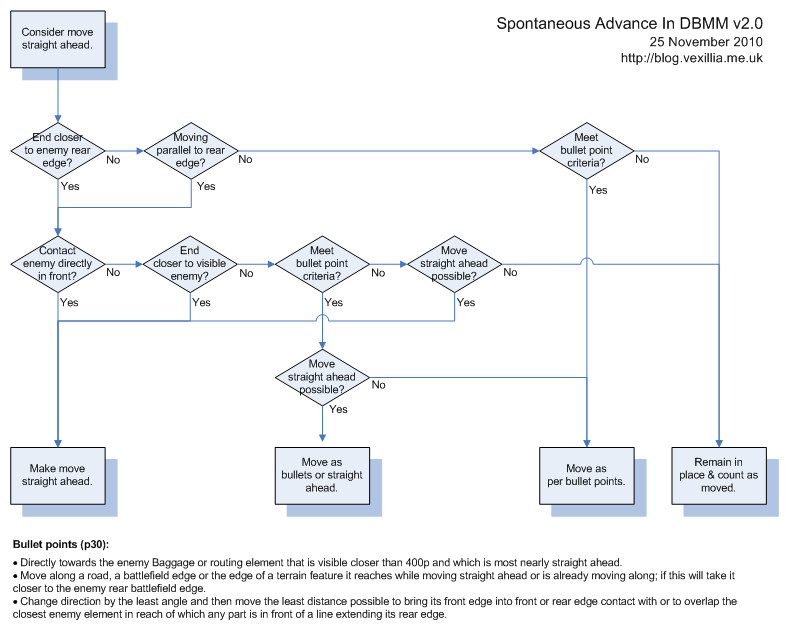 So, as a final contribution to the "DBMM for the Befuddled" series here's a pdf containing 9 examples of spontaneous advance. As always I hope this helps the Befuddled and you find it useful. As you say no full consensus on 'backward advance' but these are still helpful in other more common cases. Thank you - your clear analysis is missed.